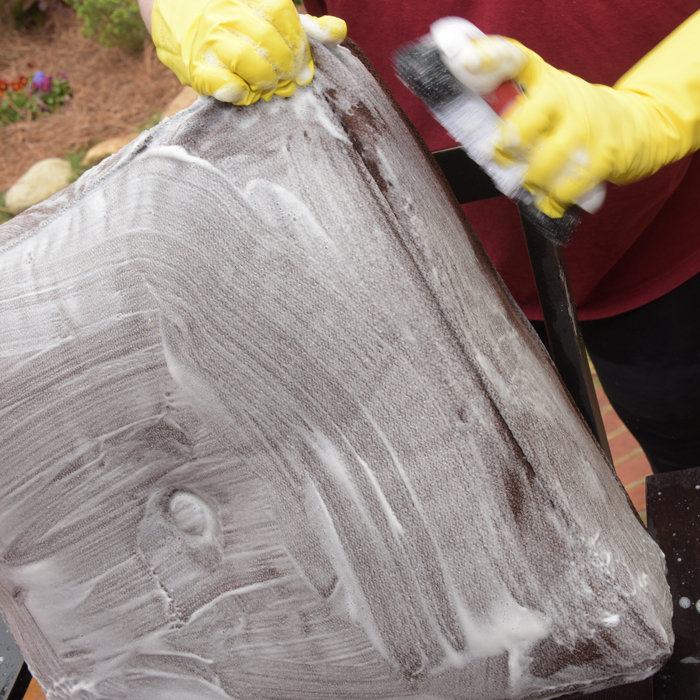 It’s not always easy to keep outdoor furniture pristine and ready for guests. Your patio furniture puts up with a lot. 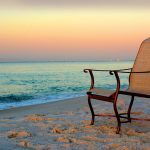 Not only is it outside all day where it’s exposed to dirt and susceptible to fading from sunlight, but your patio furniture also faces peril in the form of summertime BBQs. 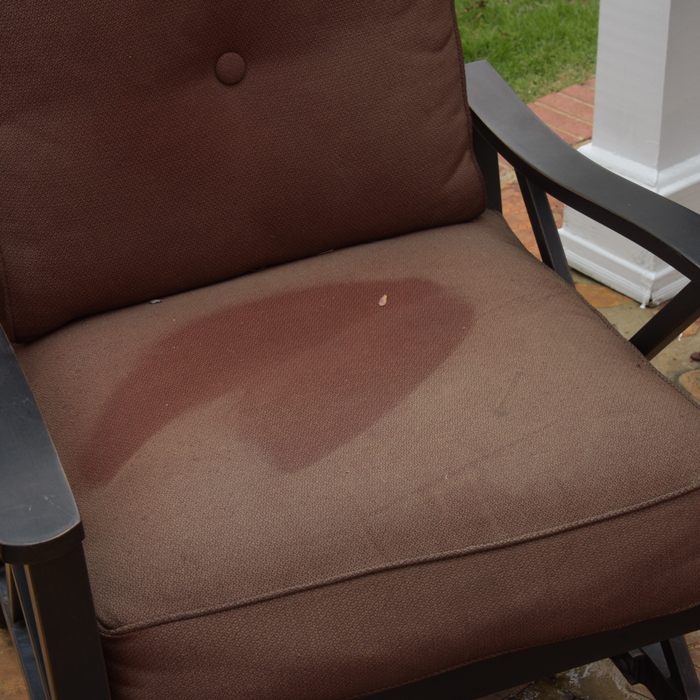 All it takes is one spilled glass of red wine, a hot dog dropped ketchup-side down, or too much greasy sunblock, and suddenly your once-beautiful patio furniture is loaded with stains. Add in the dampness which comes from the occasional autumn or springtime rain shower, and you have a recipe for mold and mildew on top of everything else. But what if you could maintain your outdoor furniture’s beauty and still enjoy good times with good people for many years to come? 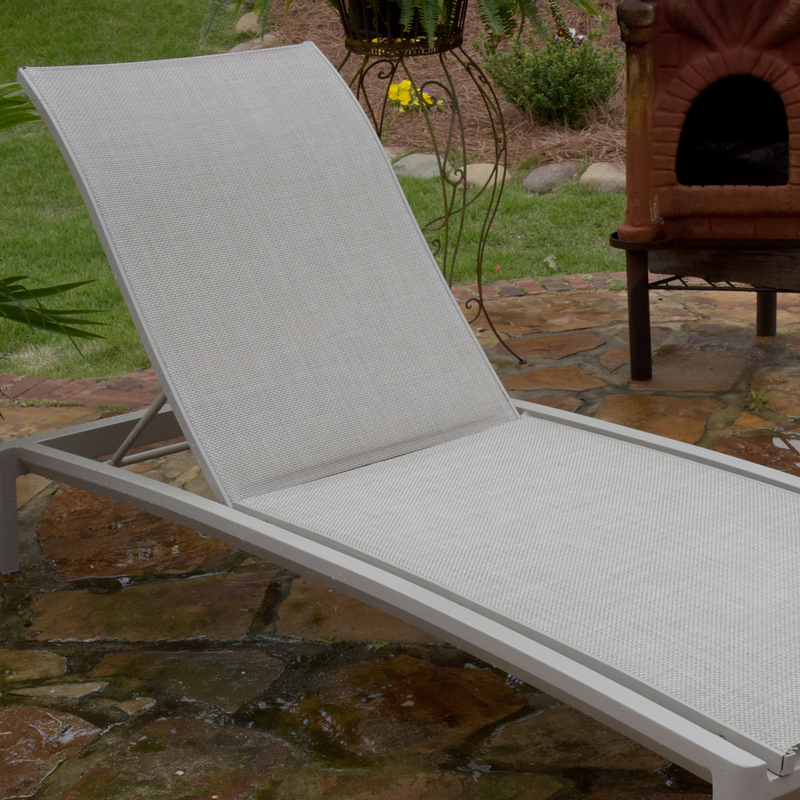 Happily, Phifer outdoor fabrics are stain resistant, mold resistant and easy to clean, which gives you a great head start. To keep Phifer Designed Fabrics at their best, all they need is a little simple care from you. 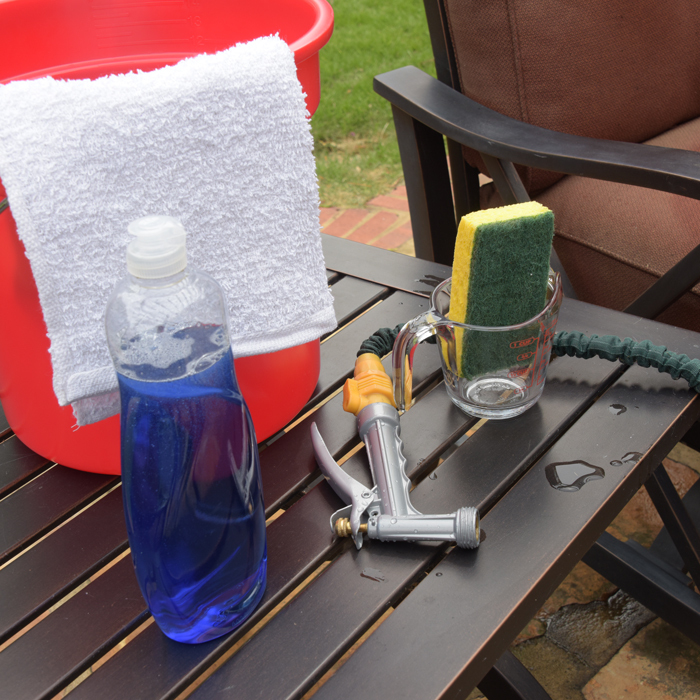 That’s why we’ve created this guide to show you how to clean Phifer outdoor furniture fabric quickly and easily. It will help you deal with whatever mess the great outdoors (or your family, friends and pets) might have in store. 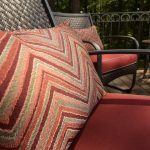 There are a few general rules about how to clean outdoor fabric that you should keep in mind when you notice that your cushions or upholstery are getting grungy. 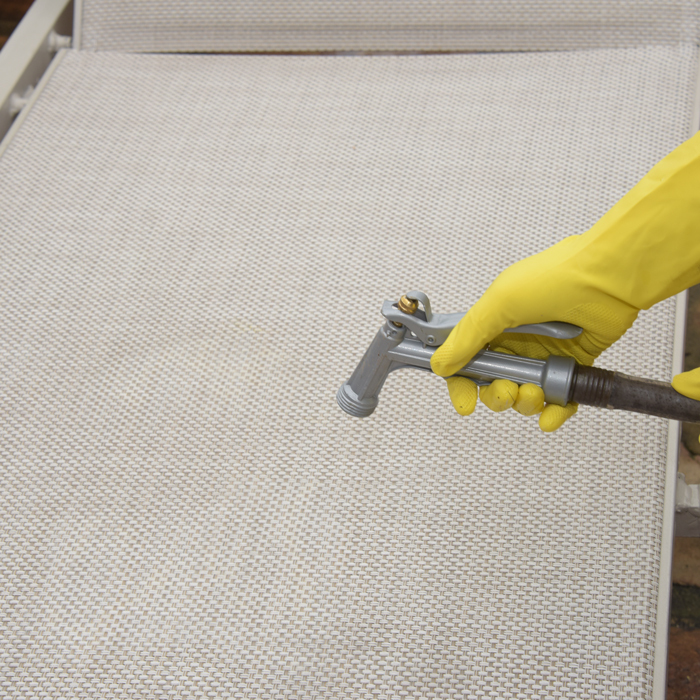 Here’s how to clean your outdoor fabric cushions easily without damaging the fabric. Don’t wait to tackle stains and spills. Reach for your cleaner as soon as you notice a spill or stain. The less time something has to seep into fabric the better and, if you can catch it before it dries, you’ll get better results. Brush off excess dirt before wetting fabric. Any dried, caked-on mess should be removed before you start scrubbing to ensure it isn’t ground further into the fabric. Dip your cloth, sponge, or scrub brush into your cleaning solution. Don't pour it on. Applying cleaning solution on a soft cloth or scrubbing device allows you to use just as much as you need directly on the fabric, without excess moisture soaking into the cushion itself. Give your cleaning solution time to sink in. You want to be sure that your product has thoroughly soaked into the fabric so that it has time to work its magic and lift the stain. Scrub gently with a soft-bristled brush. Small, circular motions will help to loosen stains that cling to fabric fibers. Avoid scrubbing too hard to avoid wear and tear on the fabric. Rinse with plain water after washing. No matter what cleaning solution you use to remove a stain, it’s important to make sure that you rinse your fabric thoroughly. Any soap, bleach, or cleaning product residue left behind has the potential to make things worse, causing streaking or discoloration. Be sure to give your furniture ample airflow while it dries. 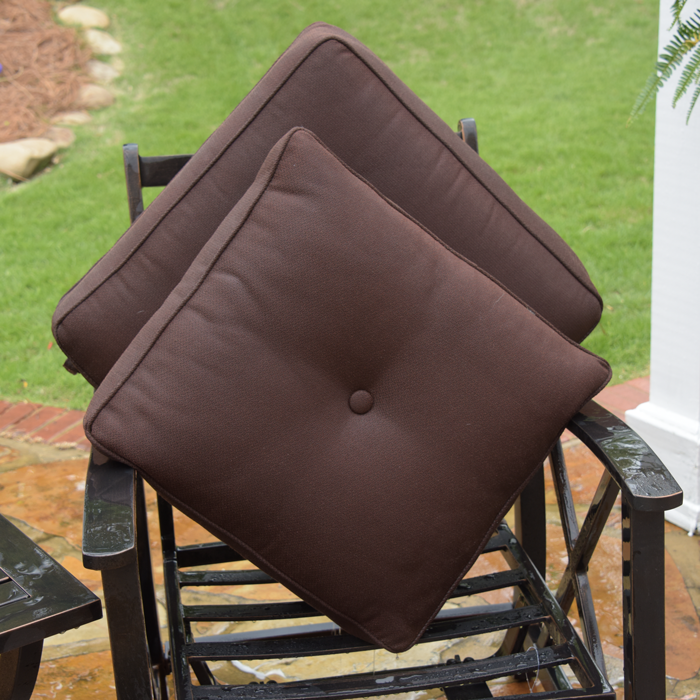 Fabric that remains damp for long periods of time is more likely to suffer from mold and mildew.Stand cushions on their side while they dry and turn them as necessary to allow them to dry out evenly and completely. 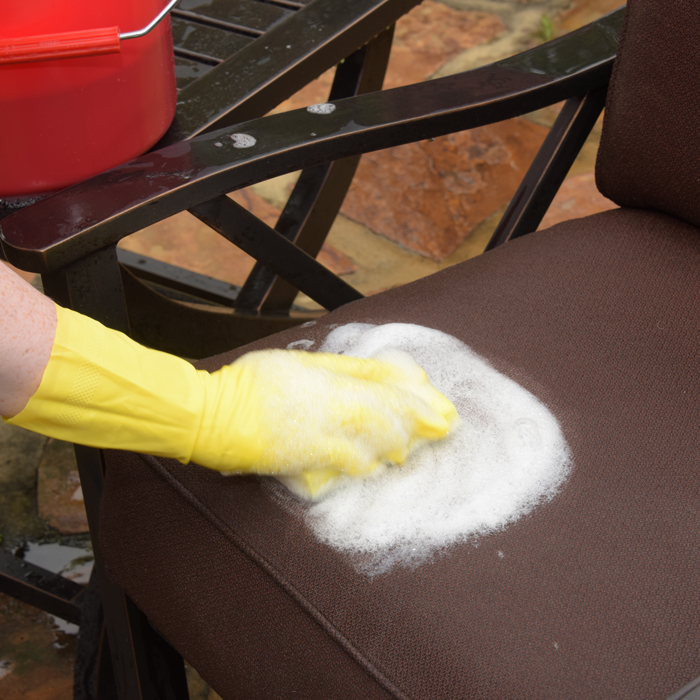 Wondering how to clean patio furniture fabric naturally? 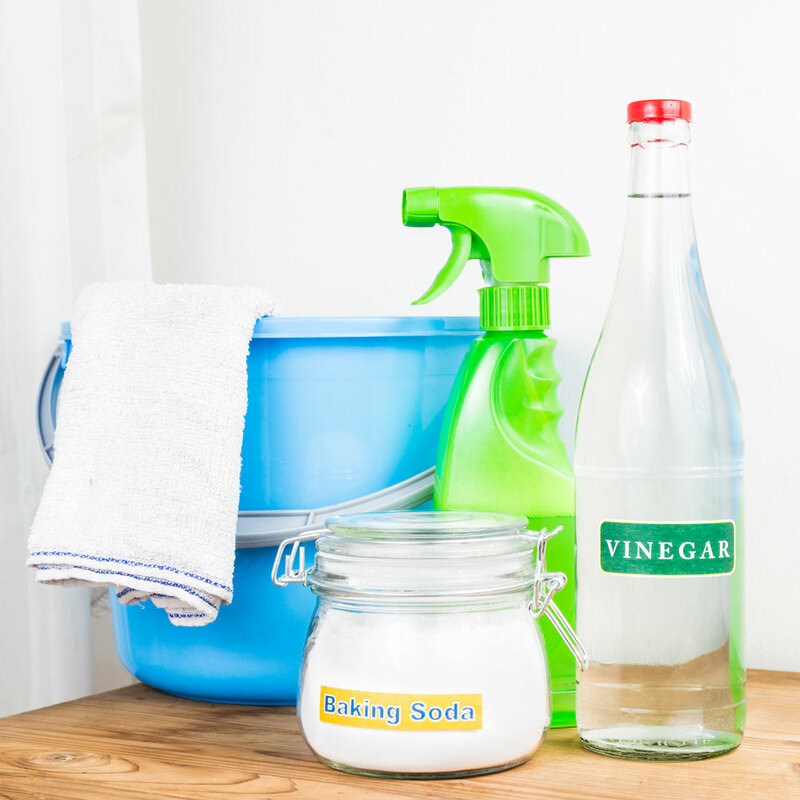 Most of our recommended stain solutions simply use common household ingredients such as vinegar and water, which is a great alternative to chemical-heavy commercial cleaning products. They are gentler on your fabric, too. By substituting an organic dishwashing soap (look for the USDA certified organic label) you can easily clean most stains. Most messes can be mopped up with plain old dish soap and water, but some stains require special treatment. Here are some recommended approaches to the usual stain suspects. Follow these tips whenever you need to clean Phifer’s designer outdoor fabrics such as Phifertex® and GeoBella®. Apply cornstarch to absorb as much as possible, remove excess with a straight edge and clean remaining residue with dishwashing liquid and water. 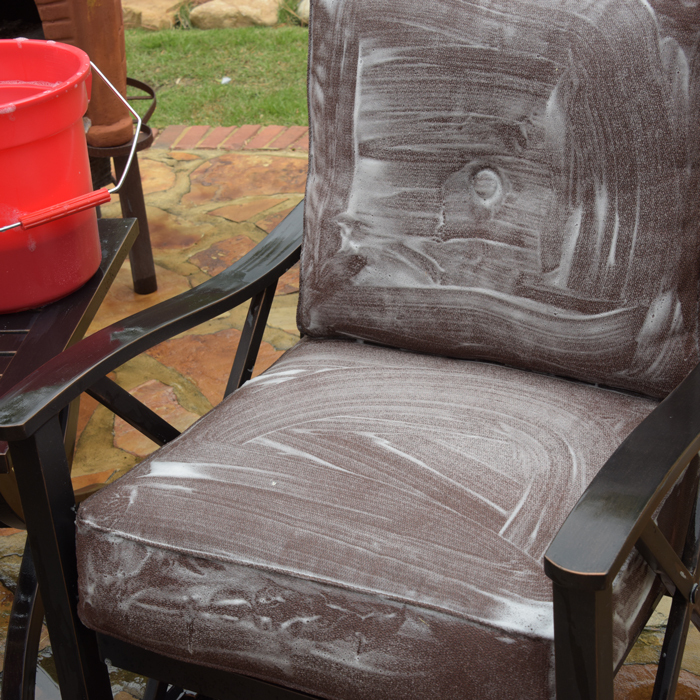 For tips and tricks on cleaning your beautiful outdoor fabrics, check out our video that will show you how to clean outdoor furniture, cushions and pillows. Mold and mildew are common enemies of outdoor fabric and should be addressed quickly, when you see the first signs. 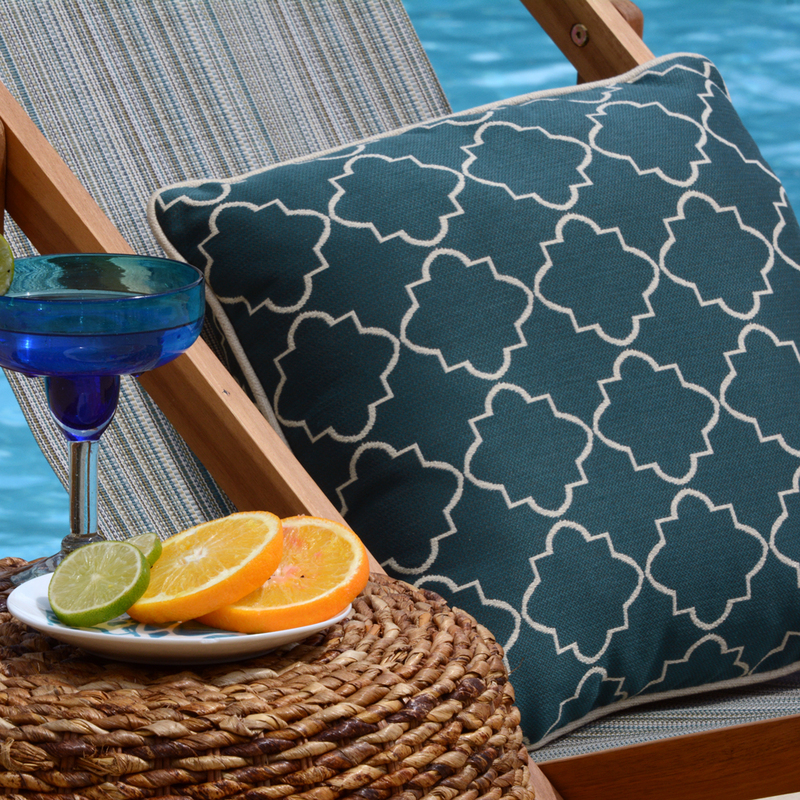 Phifer designer outdoor fabrics are treated with Microban®, anti-microbial protection which works continuously to slow the growth of bacteria, mold and mildew on outdoor furniture -- even in damp conditions. First, brush off mold and mildew spots with a dry scrub brush or broom, removing as much dusty residue as possible. Combine 1/4 cup (60 mL) dishwashing liquid and 1 cup (236.6 mL) bleach per gallon (3.8 L) of water. Spray onto affected areas with a spray bottle, saturating the fabric. If possible, allow to sit in the sun for 15 minutes, and then scrub gently with a soft-bristle brush until the spots disappear. Sometimes a stain simply won’t budge. You can try taking it to a professional cleaner to see if they can work their magic, but if they fail, you will likely need to replace your fabric. 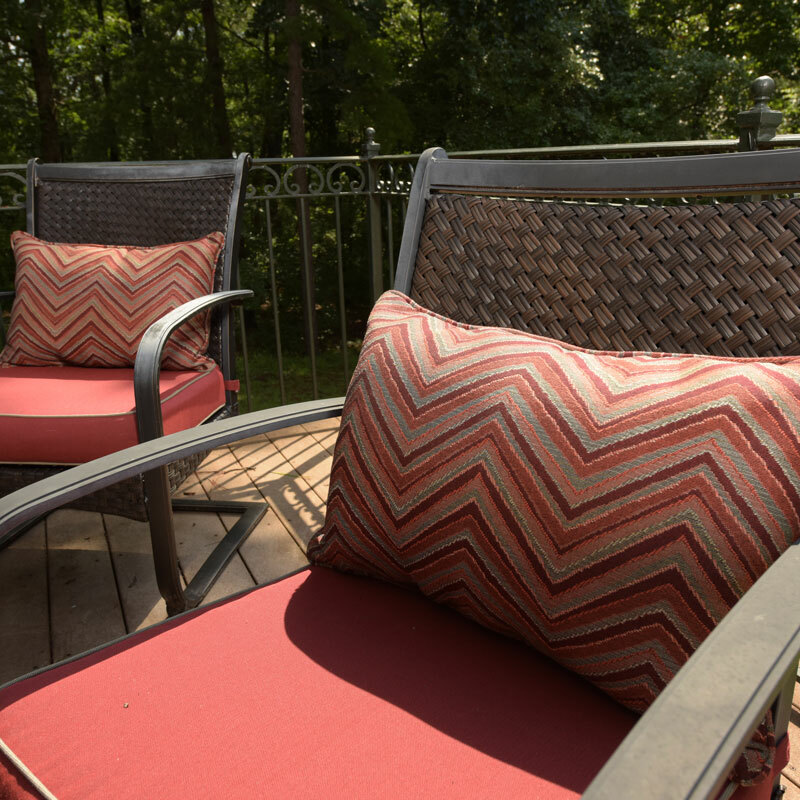 Phifer has created comprehensive guides to reupholstering your outdoor furniture yourself and, with our spectacular range of designer outdoor fabrics, you can refresh your outdoor area with an exciting new look that will make you smile with pride every time you sit on your porch. Better yet, Phifertex® fabrics are backed by a 3-year limited warranty. 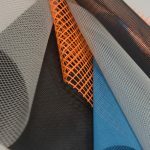 Slingable & Multi-Purpose Fabrics - Phifer’s slingable fabric collection is both beautiful and rugged, carefully engineered with the stability and strength needed to hold up to the tension of sling furniture and many other outdoor and sporting applications. Cushion and Pillow Fabrics - Discover our gorgeous range of luxury outdoor fabrics, including enough wonderful prints, solids, weaves and textures to make your outdoor decorating dreams a reality. Wall Covering Fabrics - Inside or outside, on walls or as upholstery, our wonderful wall covering fabrics are attractive, hard-wearing and so easy to clean. As with most things, prevention is the best way to save money and get the most value from your outdoor furniture. Regularly spot-cleaning and wiping down your outdoor fabric, and jumping right on stains as they happen can extend its life by many years. 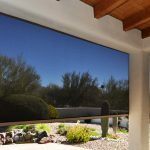 When the time comes to replace your outdoor fabric, the Phifer Outdoor Fabric Visualizer gives you a sneak preview of all your options. You can mix and match, play with color and texture, and see how your favorites combine with sample images. It’s a fun way to plan a beautiful new outdoor space. Do you have more questions about cleaning or caring for Phifer Designed Fabrics? Please get in touch with us! We’d love to talk with you over email, online chat or phone. 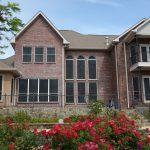 If you’re ready to replace your outdoor fabric, we can help with that, too. We can even help you find online and offline retailers who carry the Phifer Designed Fabrics you’re looking for.